The Inner Wheel Club of Neepawa, Manitoba, is currently celebrating 63 years of friendship, community service, fun and collaboration with our Rotary Club. In 2016, we celebrated our 60th year—by hosting the 2016 International Inner Wheel District 555 'Fun & Friendship' AGM and by cutting cakes together to honour our longest-serving members—who have been with our Club almost from the beginning in 1956! See, below, our Events, 1956-2016 Historic Slide Show and Story. Neepawa Inner Wheel Club Members at the 2019 Neepawa Rotary Paul Harris Night. • We regularly participate in our District 555’s ‘Fun & Friendship' AGM Meetings, our Annual 555 District Meetings and Spring Teleconferences. In 2016, we celebrated 'Fun & Friendship' and other events to commemorate our 60th year and to honour our long-est serving members. • We meet once a month, on the first Monday—from September to June. Our dinner meetings are in October, December (for Christmas), April (for Easter) and June. The other five months are dessert meetings. • Every year, we participate in the Neepawa Rotary TV Auction—our Rotary Community’s largest annual Fall fundraiser. We participate as workers on the telephone and, on camera, featuring each auction item. We also supply the food for all the dozens of volunteers involved. 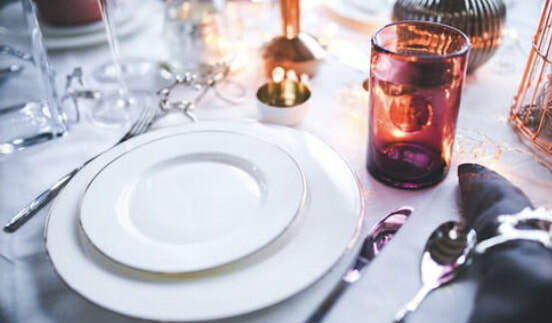 • We also provide the lovely table settings and decorations for our annual Rotary Community Paul Harris Banquet and participate in our Spring Rotary Used Book Sale fundraiser. 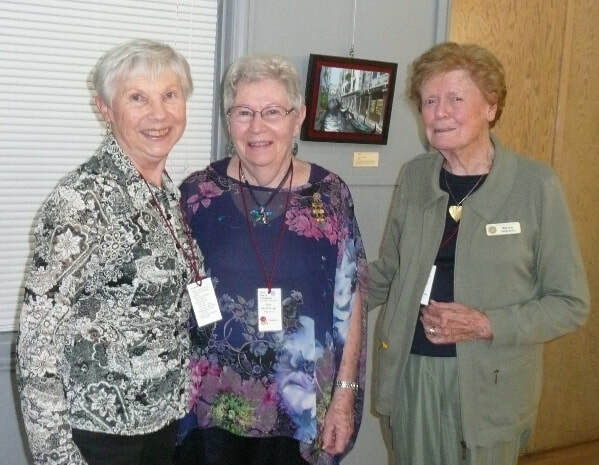 Top: As featured on the International Inner Wheel website, 2016 Canadian IW National Representative Nelda Oliver with Neepawa IW Members Joan McGillivray and Marlyne Hargreaves. 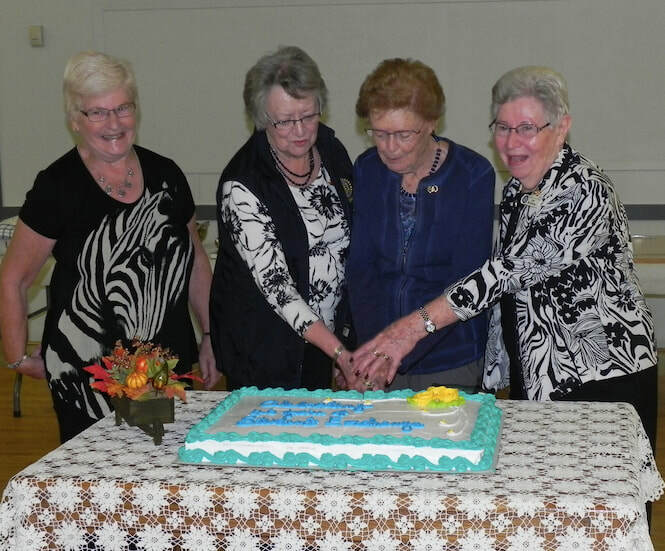 Below: Bev Finlayson smiles as Pat Traill, Marlyne Hargreaves and Joan McGillivray together cut the cake celebrating their long-service to the Neepawa Inner Wheel. • For the past 41 years, during the month of September, we are the official hosts of the annual District 5550 Rotary International Exchange Students' Orientation, where we welcome students from across the world—and their Counselors—from Rotary Clubs as far away as Kenora, Dryden and Sioux Lookout, Ontario, in the east—from Moosejaw, Saskatchewan in the west—and from Thompson, Manitoba in the North. • Each month, we deliver birthday carnations to the residents of Neepawa’s Country Meadows Personal Care Home. 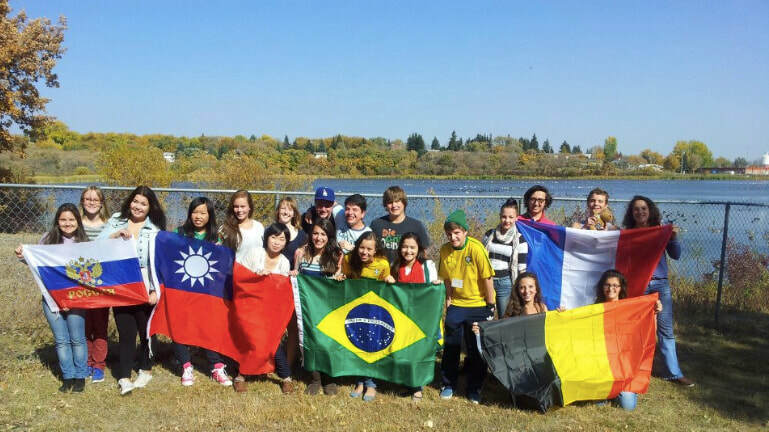 2013 Rotary District 5550 International Student Exchange Orientation, at Rotary Park Lake. • For many years, we have supported a Foster Child in Tanzania—through the Foster Parents Plan. • As well, we annually provide a scholarship for a piano student to participate in the Neepawa Fine Arts Festival. 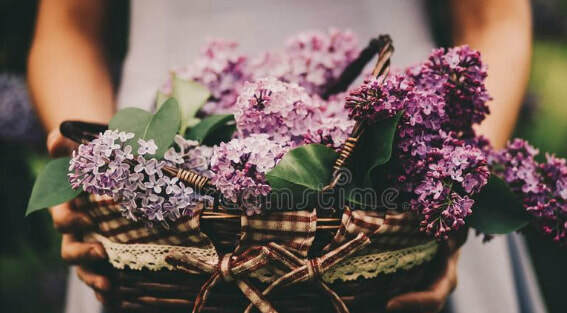 In addition to the fundraising activities, described above, we also circulate a ‘Traveling Basket’ that we share by visiting with fellow Inner Wheel Members, bringing a gift to our hostess and making a donation with each visit. In some years, we also host a ‘Guess Who’s Coming to Dinner’ evening where volunteer hosts provide a delicious meal to volunteer guests who make a donation for the evening food and fun. Until an hour beforehand, only the event organizer knows all the details as to who is hosting and who is ‘guesting.’ Hosts and guests discover this at the last minute and this is part of the fun! In 1956, the Charter Meeting of the Neepawa Inner Wheel took place at Knox Presbyterian Church. Present were 24 ‘Charter’ members, along with five visitors from Minnedosa. Neepawa’s was the third such club to be formed in Manitoba — Winnipeg and Minnedosa already had clubs by this time. In keeping with the founding motto ‘Friendship & Service,’ clothes, books and toys were sent to an Indian Mission in the North West Territories. Patients at the Brandon Hospital of Mental Diseases were remembered with Christmas gifts and holiday hampers were provided for Neepawa shut-ins and people in need. In 1964, a ‘Farmer Doll’ was sent to Australia to add to their collection from all over the world. In 1965, Neepawa’s contribution to the International Inner Wheel Recipe Book was for pumpkin pie! In 1978, Neepawa Inner Wheel members noticed that this area’s Rotary International Exchange Students needed an opportunity to meet each other and get acquainted. Thus, these students were invited to Neepawa, hosted by Rotary families and gathered — over a weekend, in a member’s home — for a time of fellowship and fun. This event became so popular and well-received that it has since evolved into what is now a compulsory orientation for all international exchange students in this Rotary District. Inner Wheel still organizes this event and, assisted by Rotarians, hosts these students with activities such as a wiener roast and tours (See above). Over the years, Neepawa has entertained three Inner Wheel International Presidents and convened four ‘Fun & Friendship’ events. Our club is proud and pleased to have had members serve on Inner Wheel’s National and International Boards, with many others having served and continuing to work at District and local levels.